A while ago, I mentioned my “other” dog, Dorie. Technically she’s my parents’ dog, but every time I go home and get accosted at the door, I’m reminded of the very special bond that she and I share. 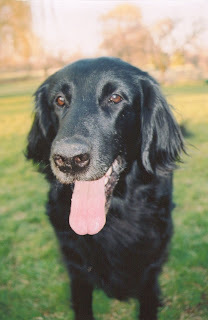 I’ve wanted to write a post about her for a while because she had a near brush with death, but thankfully pulled through and I’ve had several recipes put aside just for her (all of them with “angel” in the title). 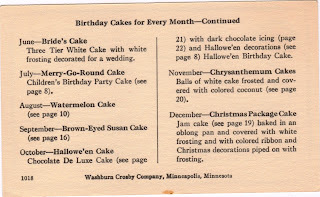 Then I remembered that I hadn’t yet posted the birthday cake for the month of June and quickly pulled out the Birthday Cake for Every Month card to check what was next. 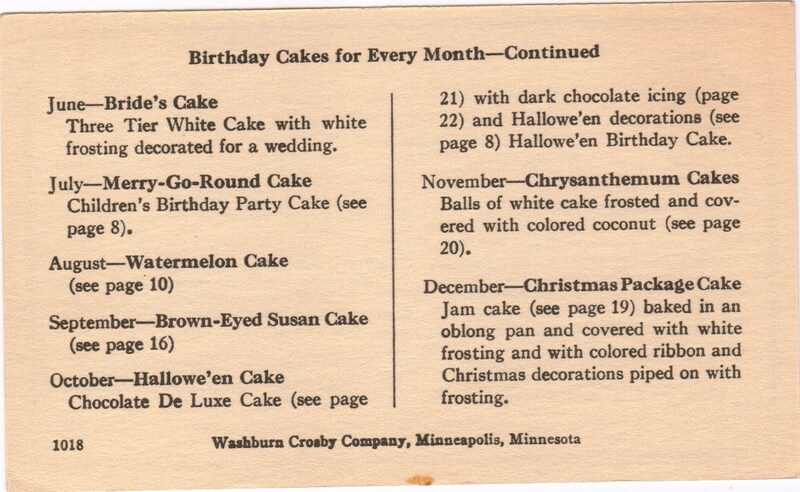 Ironically, the cake on the card wasn’t listed in the New Party Cakes for Every Occasion booklet so I’d have to choose another cake from the booklet to substitute. 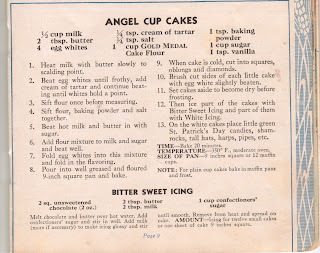 And I found the perfect one: Angel Cup Cakes. Dorie celebrated her 10th birthday this spring and I’ll never forget when she was born. 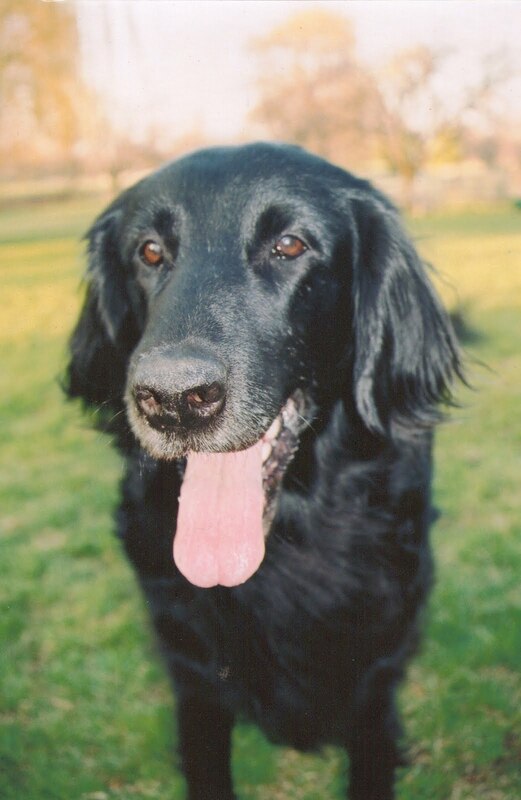 We had tragically lost our previous Flatcoated Retriever, Buck, and after his death we tried to contact his breeder to alert her of his passing, but couldn’t locate her. I went online to contact other breeders in the area to see if they knew how to find her. 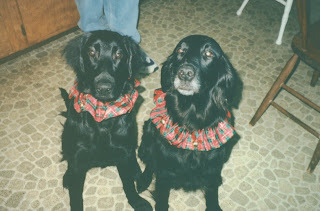 No one did, but they put me in contact with a woman who worked with the Flatcoated Retriever Society of America, Joan. I didn’t know it at the time, but Joan would end up having an incredible impact our lives. I shared our story with Joan and told her of the amazing connection with had with Buck, of his seizures, how he ultimately went into one he never came out of and died with my mom and me by his side. She tracked his lineage, did research into his lines and tried to identify where, or if, epilepsy was ever in his family history. Afterward, she told me she wanted to find us a puppy. I explained that we weren’t ready quite yet, but we’d let her know when we were. Well, she was ready before we were because she contacted us again and told us of a litter in Tennessee, insisting that we bring home one of the puppies. 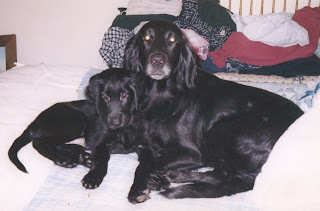 They were offspring of one of her dogs, a dog that was as special to her as Buck had been to us. We couldn’t say no. Before we were able to drive down to Tennessee to pick up our new puppy, we got another call from Joan. 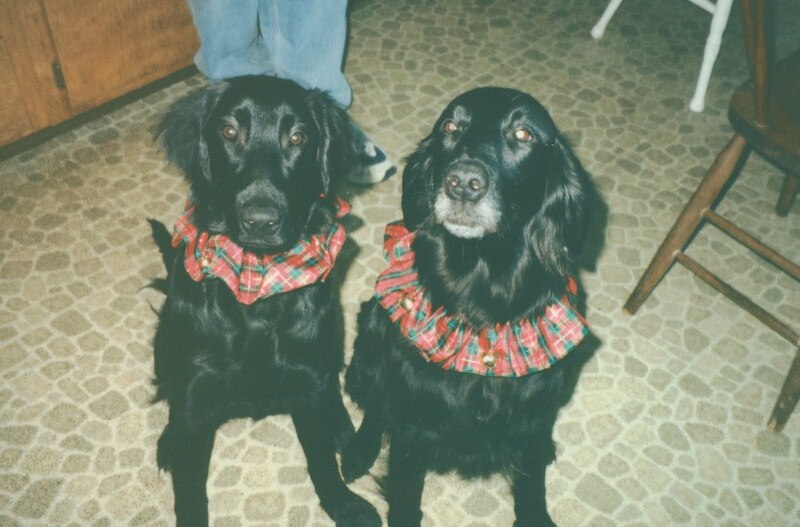 The breeder had passed away and her husband wanted to find homes for the adult Flatcoats, he didn’t want to continue breeding dogs without his wife. 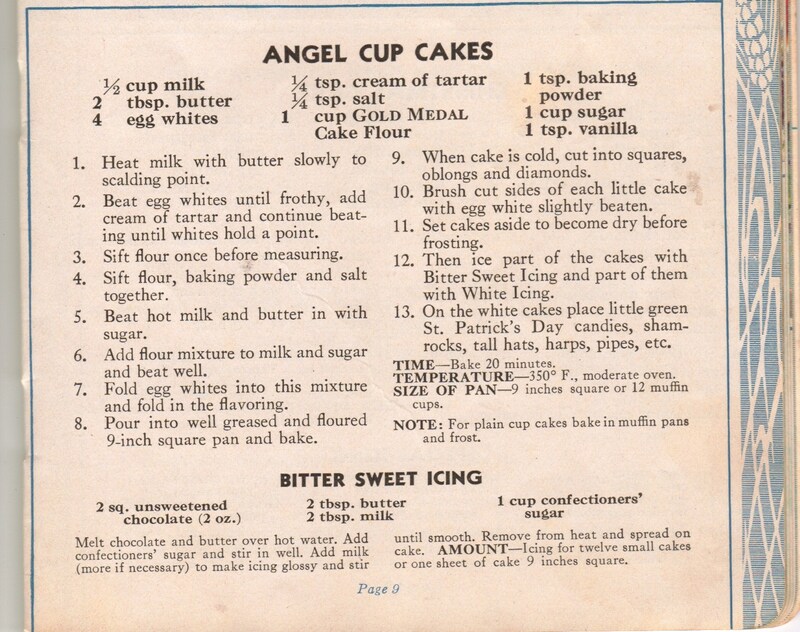 Joan had recommended that we be the ones to take the mom dog, Bonnie, as well as our puppy. Bonnie had been the breeder’s special dog, a bond my family completely understood, and we were honored that Joan choose us to take her. Keep in mind, we had never met Joan, she had never seen our home and didn’t personally know our previous dog. We had conversations over the internet and phone. But it was our true love for this very special breed that brought us together. And something we said about our love for Buck and how deeply his loss devastated us had resonated with her, sealing that bond without the need for a face to face meeting. We agreed to take Bonnie. Doing so was not only very special, but also heart wrenching. She looked longingly at her owner wondering why he was putting her into a stranger’s car. It was so hard to take this heartbroken dog away from her home, but we promised her owner that we would love her immensely and give her a happy life. And that’s just what we did. Not long after she arrived at my parents’ house, Bonnie quickly bonded with my dad. He now had a relationship with her similar to the one my mom and I had had with Buck. And while those two were wiggling their ways into each other’s hearts, Dorie was doing the same into mine. Dorie was hesitant about life at first. She spent her first few days at our house buried beneath tables or hidden behind couches. We worried that she would never warm up to us. But soon, she began to explore her surroundings and us. She and I would go on adventures in my parents’ acre-long backyard. Beneath the huge weeping willow tree we’d search for bugs, mice and whatever else called the aging bark and loose dirt around the roots home. I’d watch as she’d hunt frogs in the small pond, snapping at the water and stepping in lightly, not caring that my mom was yelling at her (and me) from the deck to get out. Dorie developed a special way of chewing on my arms to greet me and using her front teeth to carefully pinch the skin on my legs to get my attention. My mom told me that Dorie had decided I was one of her “litter mates.” I and one of my brothers’ friends were the only two people she did this to. As annoying as it could be, I also felt proud to be chosen as one of her siblings. There are times when our pets can literally make our hearts melt and Dorie does it to me every time I go home for a visit. I’ll be sitting on the couch watching TV and I’ll hear a thump. Thump……..thump. Thump….thump...thump. I’ll look up to see her laying at my feet, staring at me with the most loving gaze and her tail slowing wagging faster and faster against the hardwood floor. When our eyes meet, it will turn to thump, thump, thump, thump, thump! At that point we’ll both get up, go in for a hug, and I’ll get a face full of dog tongue. Dorie isn’t big on hugging, she likes her personal space. But if you let her lick your face and arms she’s a happy dog. Recently I’ve started to catch Murphy staring at me the way Dorie does. He’s more stealth about it though and doesn’t wag his tail. But the look in my Golden Retriever’s eyes is priceless and reminds me of my sweet dog Dorie every time. When my mom called to tell me that Dorie had been rushed into emergency surgery to treat bloat, the world hung motionless for a moment. 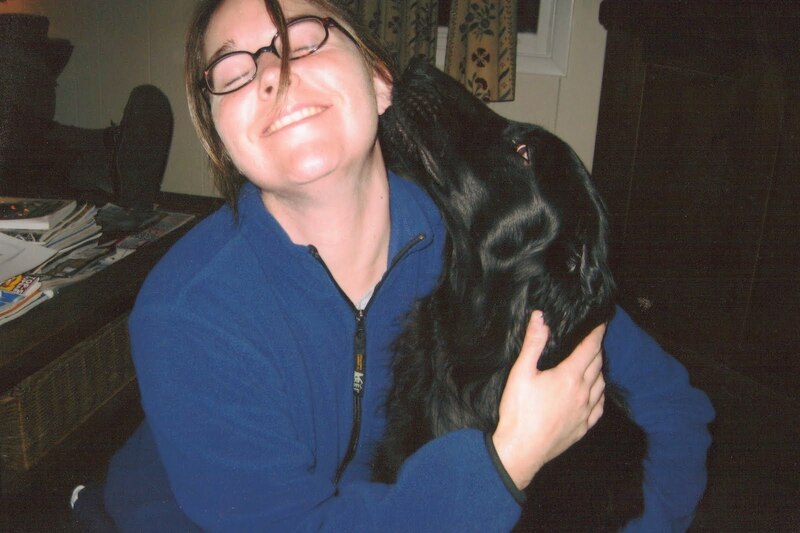 She immediately followed up with “She’s O.K., I didn’t want to call you until I knew that she was going to be O.K.” But my mind was still swimming with the fear of losing my special dog. I thought of watching her swim in her pool, our hunting adventures in the backyard, all the obedience, rally and field work she did with my parents, how funny it is to watch her fish in the lake (she literally studies the fish and snaps at them, someday she’s going to get one! ), or the tail thumping I love so much. ...and stepping in for a closer look. But someone was looking out for her, someone knew we needed more time. And I thought that someone just might be the woman who brought us together in the first place. Dorie had a guardian angel looking out for her that day she went into surgery. And I’m so thankful she did. None of us were ready to say goodbye. When I went home for Memorial Day weekend, I gave her the biggest hug ever, even though she doesn’t particularly care for them. But she just leaned into me and absorbed every ounce of love I sent her way. Her incision had healed, but it was major surgery and still very fragile so we had to be careful. But the first thing I did was go out into the yard and embark on the adventures I’ve loved having with my dog. The willow tree is no longer there, but the pond is and she went right in. Then we swam in the pool, searched for bunnies under the shed and investigated all the flowerbeds for any treasures to be found. And every time I watched her do one of the activities she loves so much, I thanked her angel for looking out for my sweet dog and allowing me more time with her. That she is. And Dorie, I don’t care what mom says…you’ll always be my girl.